These epigenetic codes also reflect and provide information about the transcriptional regulatory complexes involved in dictating cell fate (Eguchi et al. No sequence was identified for this gene that could form a typical rho-independent transcriptional terminator. In 2010, BioTime announced the publication of a peer-reviewed scientific paper titled "Spontaneous Reversal of Developmental Aging in Normal Human Cells Following Transcriptional Reprogramming" in the journal Regenerative Medicine. She described transcriptional profiling as 'a major step in the right direction'. Breast cancer breakthrough in gene profilings? Gene fragments were selected as candidates for analysis if DNA macroarray analysis indicated transcriptional up-regulation in at least four of the eight patients. 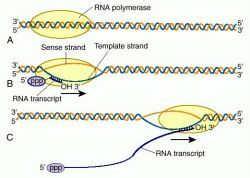 Two types of gene silencing have been identified: post-transcriptional gene silencing (PTGS) and transcriptional gene silencing. The following may indicate reasonable cause and good faith: (1) reliance on a proposed regulation; (2) an honest mistake of fact or law reasonable in light of the taxpayer's experience, knowledge and education; or (3) a computational or transcriptional error. Genes have their own transcriptional regulation elements that will allow them to be expressed in a certain time in development and that allow them to be expressed in particular types of cells," says Elaine A. Other topics include telomerase biogenesis, transcriptional and post-translational regulation, off-telomere functions of telomerase and the role of telomerase in cellular senescence, aging and cancer. It involves cell autonomous transcriptional reprogramming and subcellular remodelling, Leading to repositioning of subcellular structures, Cell polarization and multiplication of organelles. In this work the role of different modifications and their interplay, involving the regulating the transcriptional activity of FOXO1, is investigated by using various bio-informatic tools. Their research revealed a new and previously unsuspected role for nuclear receptor corepressor (NCoR), a transcriptional coregulatory protein found in a wide variety of cells.